A couple people were over last night, and we decided to watch a modern classic of Canadian cinema – One Week. The movie stars Joshua Jackson as a young guy who finds out he has cancer and is probably about to die. Before entering treatment he wants to take an adventure, and begins a motorcycle trip across Canada, from Toronto to the westcoast. As the film goes on, he questions his life so far and his relationship with his fiancee, and searches for a mystical creature called Grumps. He also takes photos with the world’s biggest dinosaur, adirondack chair, nickel, fire hydrant, hockey stick, and others. We were also having a little fun with the mistakes in geography. I guess doing an actual cross country trip would have been too much, because they did jump back and forth between east and west. Duncan’s giant hockey stick is apparently in Ontario according to the film. It was still a good film. It makes you a little homesick. There are many truly amazing things about Scotland. Of course, there is the rich and often bloody history, the beautiful natural landscapes, and obviously the whiskey. One that often escapes mention is that you can get all you meat dishes in pastry form. Some would say that this diet is not in your long term interest and those people would probably be right. However, it is essential to eat like a local as much as possible. In Scotland, that means takeaway shops. 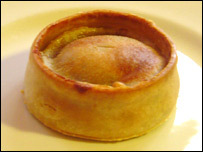 Pies and pasties have fuelled the Scottish working man for generations…who am I complain.